I've got to hand it to the French. They know how to throw a party. They know how to celebrate the simple and the extravagant. Today was the first day of Summer, a seemingly simple day, but no, not here. The first day of summer is also known as Fete de La Musique, which is one enormous music festival, held all over the country. It was started 30 years ago by the French ministry for culture, and has now spread to over 100 countries. In addition to celebrating the summer solstice, it's also an opportunity for musicians,professionals and amateurs alike, to perform outside of their normal venues, and for free. People were playing all types of music all over town. 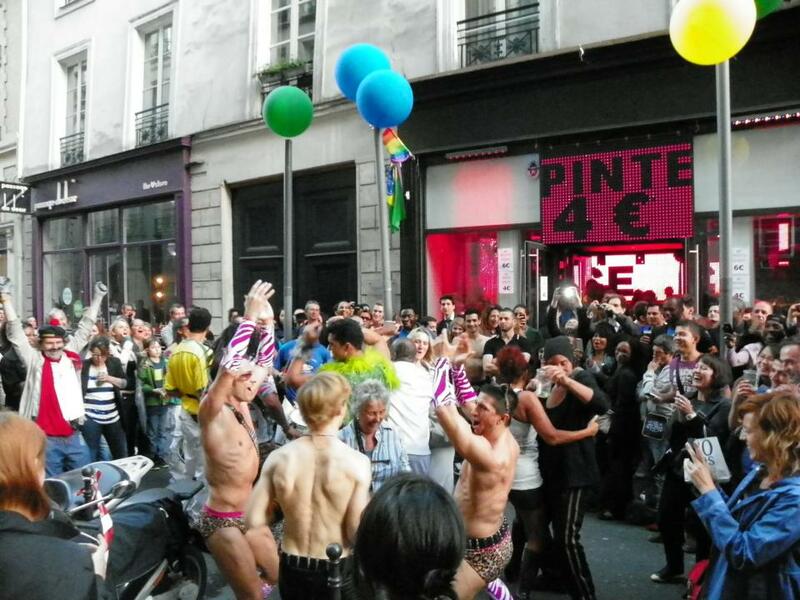 My friend Annette and I didn't leave the Marais area, and saw over 15 different performances. There was an 8 year old singing outside of a small cafe. There were guys on guitars singing American pop in French bars. There were choirs singing Supertramp in the middle of the street. We found a multi player harp recital in an outdoor museum alcove. And of course there was your Rock and Roll. Every good festival needs a hot man on a horn. We saw a random parade, though it could have been a manifestation or protest of some sort. 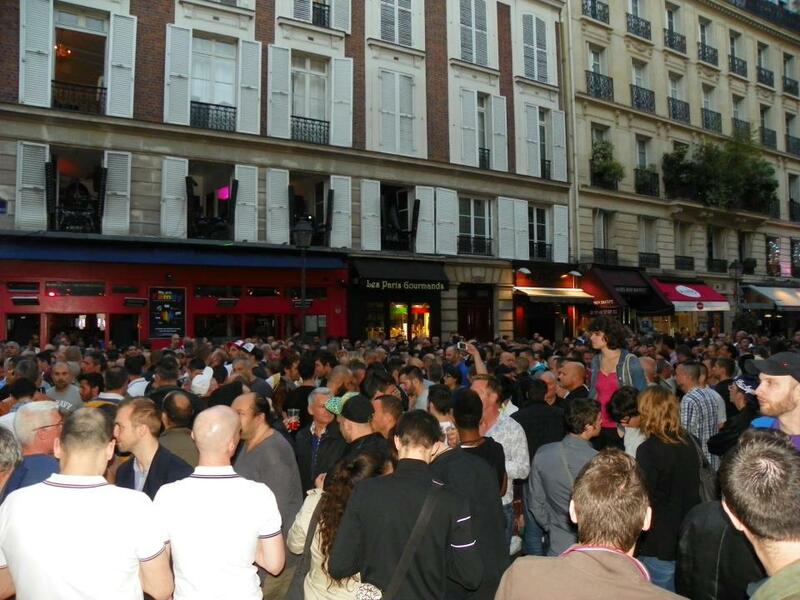 There were tons of people in the streets of the French equivalent of West Hollywood's Boys Town. And leave it to the boys to entertain and delight the masses, and also make you feel like you're not ready to get into a bikini this summer. There was also angry women singing. 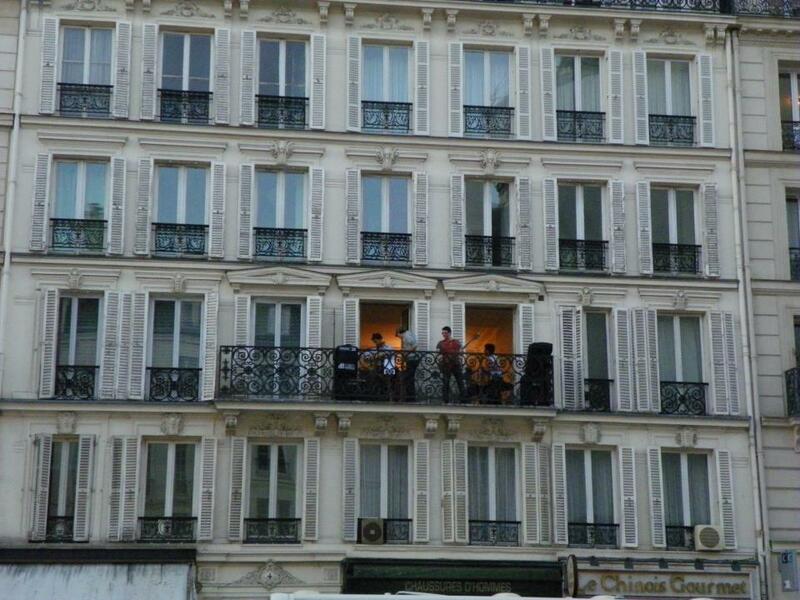 Sometimes it was a game to find out where the music was coming from, like this group playing on a balcony. Of course there was much drinking in the streets with people carrying wine bottles, beer cans, and there were even tables set up making mojitos on the spot. 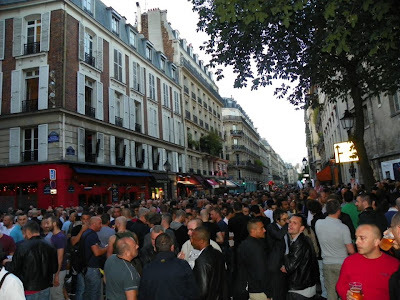 There was also a Sister Sledge sing-a-long, well an attempted one at least as some of the French didn't know the words after "We are family..." there was humming, made up words and silence after. They even had a beautiful gospel choir singing in a church. 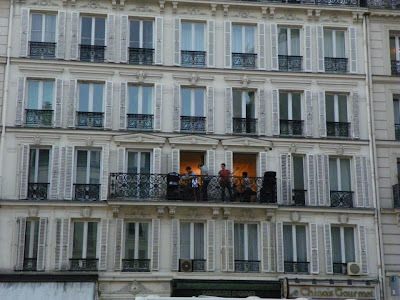 And sadly, I came home to a DJ playing in the middle of the street, right under my apartment window. It's nearly 1am now and I'm pretty sure he's been playing the same song for about 2 hours now. When it is finally over, I'll be looking forward to the next Fete de la Musique. That was such a fun night! Thanks for including me! Was so glad you were in town to Fete with me. Was a really good time!